This page will list and describe all the most popular side bets in blackjack that we have come to love (and hate), including Perfect Pairs, Lucky Ladies, Blackpot, Match the Dealer, Royal Match, Lucky Lucky, 21+3, and more. If you’re a regular blackjack player, you will have no doubt noticed or come across many exciting variations of the standard game. Blackjack is one of the most popular casino card games in the world and it’s only natural to expect several unique changes to be introduced to the game over the time. Some are virtually identical to the original template and others are completely different. One popular aspect regularly added to the traditional game of 21 are side bets. Side bets slightly alter the mechanics of play and offer bonus payouts, but otherwise retain the traditional blackjack template in that they are made separate to your primary wagers and the end goal of obtaining 21. There are several side bets out in the wild and for your convenience, we are covering the most popular ones regularly added onto traditional blackjack games. We’re going to examine their rules and odds to determine whether or not blackjack side bets are worthwhile. Blackjack side bets are optional wagers offered in many games of blackjack, both in live casinos and online games. They’re specifically designed to offer attractive bonuses which, in turn, lure more players to the tables. Blackpot: The Blackpot side bet, popular at Melbourne’s Crown Casino, offers players the chance at large payouts if they hit the coveted 6-7-8 combination. Usually holding a minimum bet of $1, if a player draws any combination of a Six, Seven or Eight (cannot be of the same value; must be a Six and Seven, Six and Eight, or Seven and Eight) with his/her first two cards, a payout of 10-1 is immediately granted. Opt to hit to continue the side bet, and if the 6-7-8 combination is completed with the other card value (a total of 21), a 100-1 payout is awarded. If this eventuates, the side bet carries over to the player’s next hand free of charge, and the payouts become even greater if a successful combination is managed again. A subsequent two card combo of any of the three cards nets a 1000-1 payout, and completing the 6-7-8 three-card combo on this second consecutive hand nets a maximum payout of $20,000. Read our Blackpot article for further info about the mechanics of this unique side wager. Lucky Ladies: The Lucky Ladies side wager is popular throughout the United States and in the online gaming community, and is based on a player’s initial two cards, and those cards totalling 20 points. We have multiple options of initial two cards totalling 20, each which hold different payouts for this side bet: two non-suited cards, two suited cards, two matching cards of the same suit and rank, a pair of Queens of Hearts and finally, the coveted pair of Queen of Hearts with a dealer blackjack, which nets a payout of 1000:1. Find out the probabilities and all payouts of the Lucky Ladies side bet here. 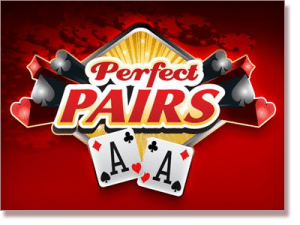 Perfect Pairs: Simple enough and very enjoyable to play, the Perfect Pairs side wager is one of the most accessible and thus one of the most commonly played side bets in the game of blackjack. Based on a player’s initial two cards, if these two cards are of the same value, a payout is awarded. There are three types of pairs – a mixed pair (two cards which differ in suit and colour, but are of the same rank); a coloured pair (two cards which differ only in suit); and a perfect pair (two identical cards). A mixed pair holds the lowest payout, the coloured pair then holds a slightly higher payout, and the perfect pair holds the greatest payout. Payouts can differ depending on the casino. This side wager is also used in baccarat and can be added to other card games, too. For a full chart of payouts, probabilities and combination, read our Perfect Pairs article here. Match the Dealer: A popular side wager found in blackjack as well as Spanish 21, if either or both of a player’s initial two cards match the dealer’s up-card, that player is awarded a payout based on the type of match: one non-suited matching card; one suited matching card, two non-suited matching cards; one non-suited match and one suited match; and two suited matching cards. Different games hold different payouts for each outcome, with two suited matches owning the largest payout (differs from 18:1 to 28:1). Royal Match: This side bet is based only on the player’s first two cards. If the player’s initial two cards are suited (i.e. a seven and four of Spades), he/she is rewarded with a bonus payout (most commonly 2.5 to 1). Drawing a ‘royal match’ – defined as a suited King and Queen – holds a 25:1 payout. The house edge on this wager differs depending on the numbers of decks used in a typical game. For example, if the player is dealt two royal cards (let’s say a King of Diamonds and a Jack of Hearts), and the dealer’s up-card is an Ace of Clubs – we have three unsuited cards totalling 21 and the player is awarded the specific payout for that outcome (3:1), assuming he/she placed the Lucky Lucky wager. 21 + 3: The 21 + 3 wager, like Lucky Lucky, is also based on the dealer’s up-card and the player’s initial two cards. If these three cards make a flush, straight, straight flush or three of a kind, a payout (often of 9:1 for all the above outcomes) is awarded. Hi/Lo 13: The aim of the Hi/Lo 13 side bet option is to accurately guess whether your first will be valued at more than, less than or exactly at 13, with each result offering a fixed payout. High Streak: The High Streak blackjack side bet awards a progressive bonus payout when you win several hands in a row. Super 7 Side Bet: The Super 7 side bet option is a wager that you will be dealt a seven card of any suit. Side bets are popular because they’re easy to understand, easy to play and usually offer attractive returns, separate from the main hand. As attractive and fun as side bets can be, we should use them sparingly. They are not designed for players to expect consistent winnings by banking on them, as the casino always employs a significantly higher house edge than that of the traditional blackjack game (side bets can carry a house edge anywhere from around 2% to as high as 75%).